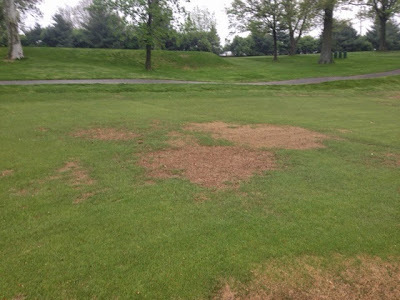 Poa Annua, Where Is It? Over the years at Glen Echo I've heard many ask about the poa on our greens. Some think its gone away. Our poa has not gone away. Poa annua is a part of all of our putting surfaces. In 1995 when the putting surfaces were gassed and grassed with a blend of Cato/Crenshaw Bentgrass, there was not any poa. 20 years later, we have greens that average 20% with some as high as 50% or more. We've made efforts to reduce the amounts over the last 7 years since I have been here. Some years it seems like we take 2 steps ahead and other years we take 3 steps back. 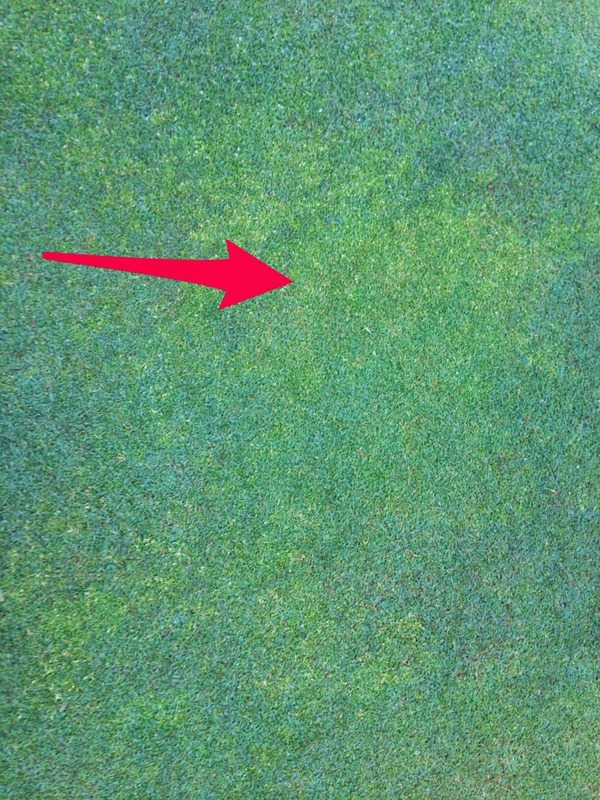 The poa right now on the greens has a tendancy to be a lighter/lime green looking color with a seed heads interspersed. The pictures at the bottom of the post points this out. In most cases instead of large patches of poa annua without any bent grass, we now have both bent and poa spread throughout the greens. A course that has been around for 114 years like Glen Echo can have many different species of poa both annual varieties as well as perennial. As you can see now in some areas of the rough, poa annua is seeding profusely. We are right in the middle of what is called the seed head flush. Pretty simple explanation is poa annua plants are in full bloom right now. This is charted using Growing Degree Day Models which help to time applications for weed and insect control. Overall, we've had pretty good timing on our greens and our efforts to reduce seed head production. 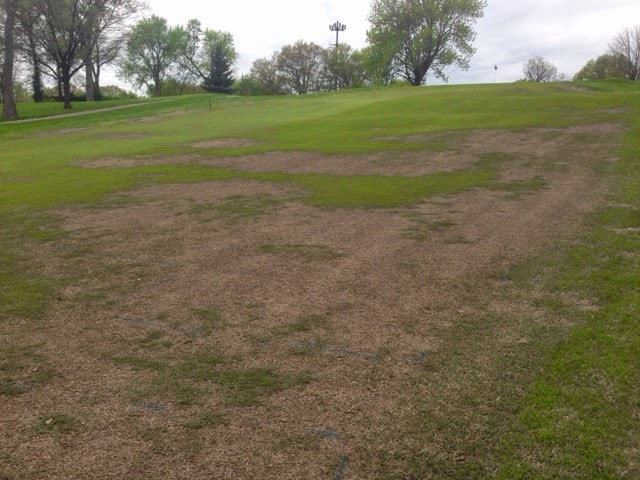 This is one reason why many have difficulty seeing the poa on the greens because we reduced the negative impacts that plants can make on ball roll and have reduced the overall seed head production on our greens. We've not eliminated seed heads by any stretch but it has improved. This season has seemed to be one of our best since I've been at Glen Echo. 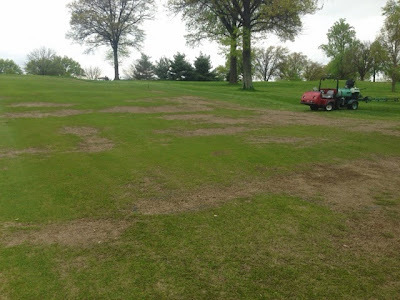 Factors we continue to fight here at Glen Echo when it comes to reducing the amount of poa annua on our greens. Greens have not been grassed since 1995. Most clubs in the district have regrassed since then and some have done it twice. This is not an option at this time. The course cannot close from September to May/June the next season. A number of clubs in town were able to renovate greens due to large scale MSD projects which helped fund improvements. Some also grassed before the economic downturn in 2008. The variety grasses we have now were developed in the 80's and probably have 25-50% less grass plants per foot then the new varieties. The tight turf does help to reduce poa from over taking a green. Greens have no drainage except natural flow except #9. Installing drainage using a technique by a few contractors in the country can cost $ 7-10,000 per green. It does improve playability, dries quicker and can reduce poa stranglehold with drier conditions. Trees which cause shade and reduce air movement keeping greens wetter longer. No fans on greens. Air movement helps in drying greens which poa annua does not appreciate. At least 6-8 greens on the course could use a fan. $ 7,000 per fan plus electric install which could double cost per green. Poa population, seed bank on a 114 year old course. Using some products on he market with the percentage of poa annua on our greens could lead to massive turf loss. Newer grassed facilities can use these chemicals because there percentages of poa annua are so much smaller. Improve and expand knowledge to combat issues regarding our greens. Provide proper cultural practices to our greens, ie fertilization, water, aeration, disease management, and many other factors to encourage bent and discourage poa. Add newer varieties of bent grass in the fall with seeding. Called inter seeding, some advances are made but it is not easy with greens being kept at normal cutting height and fall weather having a tendency to be dry which does not encourage baby plants at 1/10 of an inch to stay alive. Continue to use growth regulators to keep poa annua in check or reduced if conditions are right. As the financial climate improves, contract drainage installation to our worst greens. all out blooming like you might see on some green surrounds/rough. Another spot with the darker greenish blue areas of bent grass. I will use a regulator next week that should shrink the poa annua a little further and allow the bent grass to become a little more aggressive. I do all but eliminate the use of this product in the summer. Might tickle it a little this year but have a tendency to shy away until the real heat of summer has left us in September where we hammer it again until winter. This is showing the back edge of a green and collar on 16. Our collars have a tendency to have more poa annua. Part of the reason for this is the seed bank is higher outside the green and foot traffic/equipment move the seeds onto the green surface. 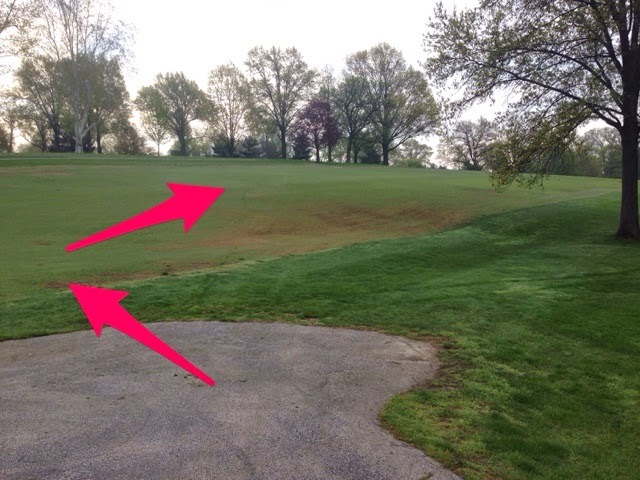 There is also a problem with collar height turf staying alive. The collars are 3 times the height of the green requiring more water to stay alive. We apply water to the greens to keep the greens alive and not enough for the collars. We have to hand water during the summer months to keep the collars alive. 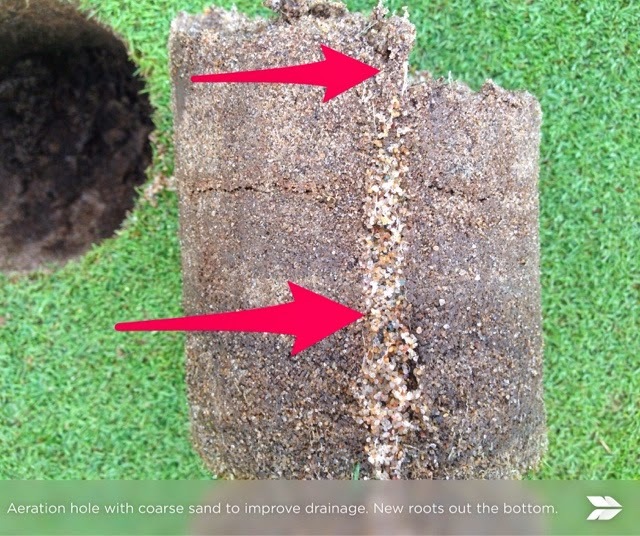 Stress on collars is significant and turf is lost. 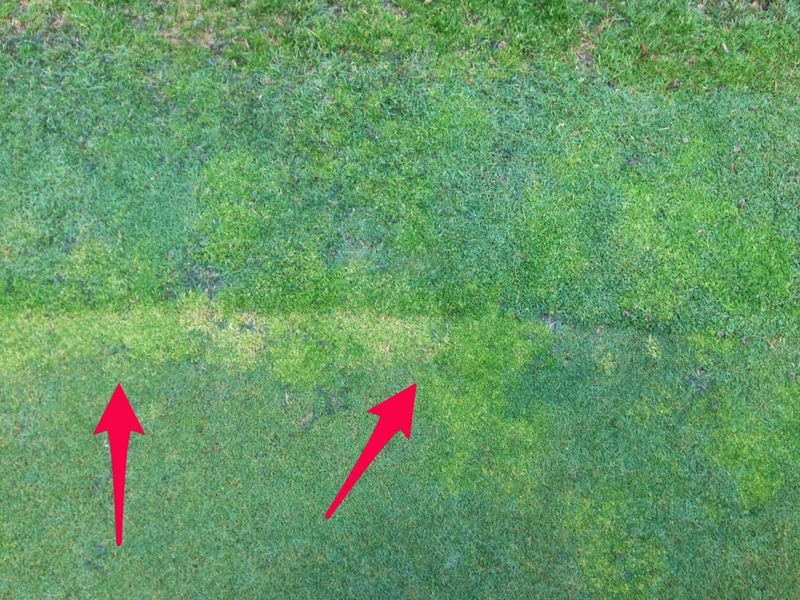 When turf is weakened or lost, poa annua seizes its chance to invade and it does. Little slow on the trigger this season but our greenhouse plant sale will be on Saturday, May 9th from 9-11 a.m. at the maintenance building. We will have a few more perennials available this season and some other plants for you to add to your patio or landscape. For our newer members, most folks walk away with15-20 plants or more to fill some pots or a planting bed. Most products will be in 4" pots. Plants are only available during the sale. We are in the process of moving plants out of the greenhouse to harden off as we prepare to plant. Plants will be sitting out and are not set out for purchase or removal without authorization. We will charge your account in the usual manner as your other purchases at the club. Proceeds from this event help to support the horticulture program at our club which is continueing to expand with the hard work of our horticulturist Becky Edwards. We save money and cash is king for us at this time. It does take labor to pot the materials but we are already here working. Yes there is some water and heating costs but we purchase material at extremely low prices based even on wholesale pricing if we bought them already grown from a local nursery. We are able to purchases varietys of plants that local growers do not grow. Unique and different plants are not available at most local growers. They produce for the masses and you are stuck with what they grow. In the end, I like to grow plants. Well, Becky grows the plants now but our group is willing to take on any task that we can to help with improving your experience at the club.When you bring guests to the club, a majority of the plantings that you will see were grown from a very small size. I think many of you take pride in these efforts made on your behalf. We are adding more work to Becky's plate this season with 7 new flower boxes on the Verandah with almost 40' of planting space on this great outdoor space at our club. We also decided to remove the strip of grass between the champions reserved parking and Mr. Ott's Clock. As mentioned in an earlier blog, the holly bushes along the parking lot were severly compromised in the winter of 2014. We also expaned the plantings off of the main patio and the planting at 13 tee was new from late last summer. We've also added some plant material along the 6 green cart path which she will be monitoring. Most of the plants in the pictures came from plugs but we have brought some partially grown material in to use for our pots and planters. Some additional material. Becky reduced her overall purchases this season with the addition of some perennials which will be added to some of our spaces reducing the need of repeated annual installs. I've made efforts since 2009 to take back control of our fairways from the hideous weed Westwood Bermuda. No offense to our friends at Westwood CC but it is a hideous turf grass. Part of the effort is to spray an area that has mostly zoysia allowing it to fill in where the Bermuda was injured. The second part of the equation is actual sod removal. 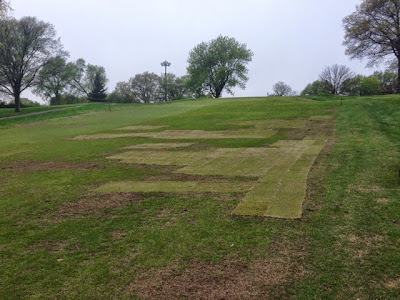 Yesterday the staff laid a couple pallets of zoysia on the approach of 12 fairway which had wider scale injury that you will see below..
Part of this Bermuda was injured by the two sprays from last fall but we also have some normal winter injury/slow to come out from the winter. We intend to do a couple of pallets of Zoysia a week for the next month or so between the other work necessary(or until I've expired the budget) allowing for enough time to grow in for 'The Invitational'. Next week I will make another application in areas where the zoysia is a bit more prevelant and can fill in. Probably no 10 acre application this time of year. We do have some zoysia that is a little weak and needs some warmer temperatures. 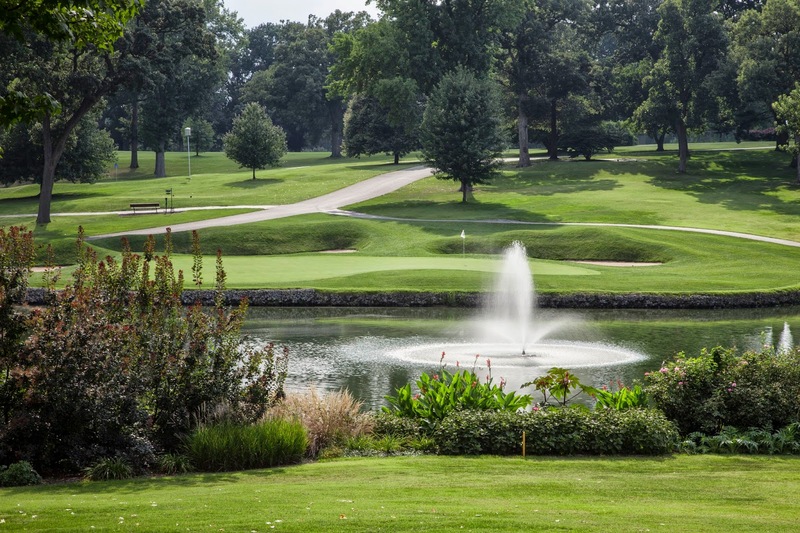 Lower wet areas and the usual heavy shaded areas are always an issue when it comes to zoysia. I will keep you updated over the next few weeks. The uphill approach to #12. 2 pallets laid in some of the area. Late in summer we will hit this area again to set back the bermuda that either tries to come back up through the Zoysia or around the edges. A few more of the larger spots will be removed next week and replaced. This is an area on 7 fairway about 100 yards from the green near the big repair done in the middle of the fairway. A good spot to remove and replace with new sod. The same area but on the opposite side of the swale looking toward 5 tee. Another couple good spots to replace. With a 5 a.m. arrival and a dash around light frost Thursday morning, the staff quickly prepared the course for a 120 person outing. Once the outings work was completed, we then moved to the Long Range Tee construction. All the holes augured yesterday for the telephone and shorter metal poles for the netting on the long range. We initially borrowed an auger from our friends at St. Louis Country Club and made an extension. Drilled a great hole but not deep enough. We were able to use the smaller auger for our 2' deep holes for our 12.5' net which will go along the left side of the tee. We rented a skid steer with our change of plans and an auger which you will see in action below. If weather is okay on Monday, we intend to put poles in place. This hole is a little wider on top because we had large roots in the auger area. Removed them with the backhoe and were able to make quick work of the 9 holes that were needed. We also drilled 9 holes with the tractor auger. We have retreated the bottom 6' of the poles with a water sealer in recommendations from Ameren where we purchased the poles. We still have to cut a few feet off the poles. The poles will be in the range tee area over the weekend. The long range tee will be closed for construction until at least 1:30pm on Thursday. With a full course event on property, we intend to dig holes for the poles for the range until the staff leave for the day at 1:30. We appreciate your understanding during this process. Recycling bin is used by both our staff, pro shop and the clubhouse. Glass, aluminum, paper, and boxes are separated as much as possible. Our staff separates its scrap metal that we accumulate in our repair work and recycle it. We have an expansive irrigation system that covers almost every blade of grass on our property but we make every effort to only utilize some of the out of the way play areas on a rare occasion. Our focus is down the middle. Automated system that automatically turns off if rain occurs. Weather station which allows us to see how potential water needs to be applied to make up for each days loss. Turf turning off color to some degree means we are managing properly. Our clippings are recycled into the rough where they can be utilized by the plants again. We use many types of cultural techniques to improve overall turf health in an effort to reduce overall applications of fertilizers/chemicals. Reduced fairway application of nitrogen by 50%. Give plant only what it needs, do not give it the ICE CREAM AND COOKIES TOO! Overall we have reduced the total amount of #'s of fertilizer used for our specific plant surfaces. Mowing injures plants and anytime you can reduce mowing reduces injury and energy required to repair it. Overall fuel usage is down because we have reduced overall mowing on playing surfaces. Facility is still as good as it was when I got here, at least that is what I am being told. Focusing on more plant health than spraying fungicides to stabilize health. Raised height on certain surfaces and making efforts to rid main playing areas of species of plants that are injured from severe heat and or cold with the changing climatic changes. 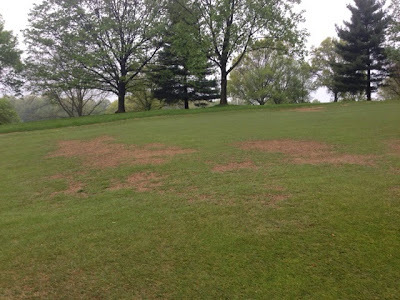 Poa annua and bermuda grass contamination in zoysia areas. Recycle all waste oil, oil filters etc. Placed emphasis on turf health and reduced specific trees around greens that force more inputs than needed. Yes I know killing a tree is sometimes necessary in our circumstance to improve our part of the earth. Healthy turf grass has many benefits! Many types of wildlife are on our property including the 4 acres of lakes that help hold water on our property for irrigation usage. A membership in which nearly 40% of the rounds are walking rounds are very helpful not only for our contributions to Earth Day but on the health of our members. 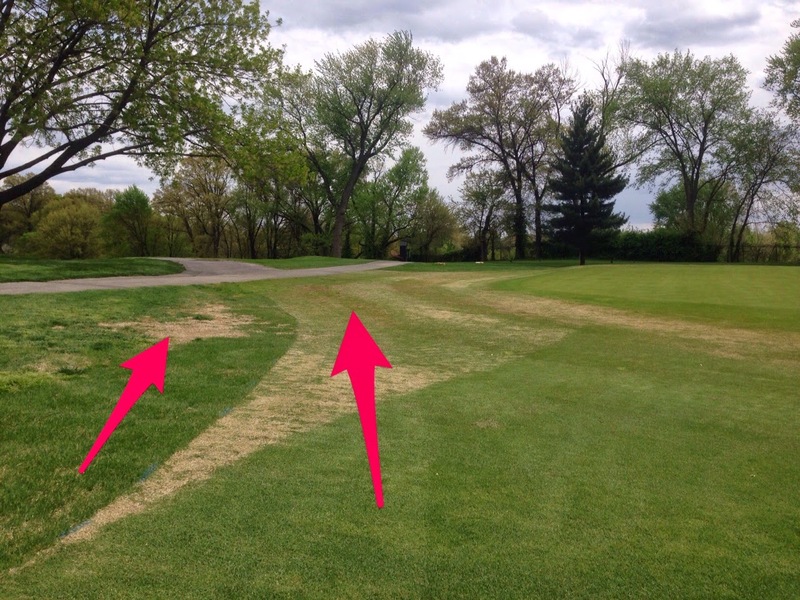 Impacts from cart traffic do effect overall growth and health of grass. Tree limbs are chipped and recycled in our ornamental beds. Decided to make an adjustment on a few greens surrounds mowing heights. We were cutting these areas a 1.25" with the intermediate mower but will be changing to near fairway height at about .60 inches with the approach mower. These areas are warm season, mostly zoysia and will become a little more receptive to a rolling ball then getting hung up on the longer intermediate cut.This will be a continuance of what has already been applied to the approaches. It will provide more definition with the tighter cut and will look pretty sharp like the new approach side of #2. Changes have been made around #1, left and back of #2, the back of #3 2 passes, left and right side of #15, and around the green on #16. #16 was not completed today due to an issue with the mower. This was accomplished through mowing and changing turf species. The area was mowed down today and should improve its look over the next few weeks with additional leaf emergence. This gives a couple of different options around our greens. Tight fairway around some greens at .60" and 2.25" rough grass around others. A different contrast in shots and techniques required for the proper struck ball. Left side of #1. Some areas scalped a little more than other but overall they look pretty good. As more leaves emerge, they will fill in and tighten the turf up considerably. Arrow on the left is the intermediate that will end at the path. The arrow on the right is the new area mowed down a little tighter. It will wrap around the back of the green and will tied in to the new bailout area on the right side. The back of 3 green surround. The left arrows are at the crest of the hill which will remain intermediate. The right arrow will be mowed down. to the approach height. The area on the sides will still remain a green rough height where it ties into the bunkers. This is the left of #15. Some benefit in rolling ball to the green but ball could also release down into the rough. A couple of excellent pictures demonstrating why we aerate greens regularly. Some might think it's just to aggravate, hogwash. Gives us the chance to modify a very tight sand profile that was placed on greens for many years in St.Louis including by yours truly. Great for smooth rolling greens but not so much for draining excess moisture from green profiles because of the small particle size which slows water moving through. Reduce compaction,Moisture movement, improved rooting and oxygen in the profile are our main goals with aeration. New sand channel in 11 green looking down into the hole. Sand channel on a new hole pulled from 11. Look at the beautiful white root which is at top of picture but of course toward the bottom in the green. 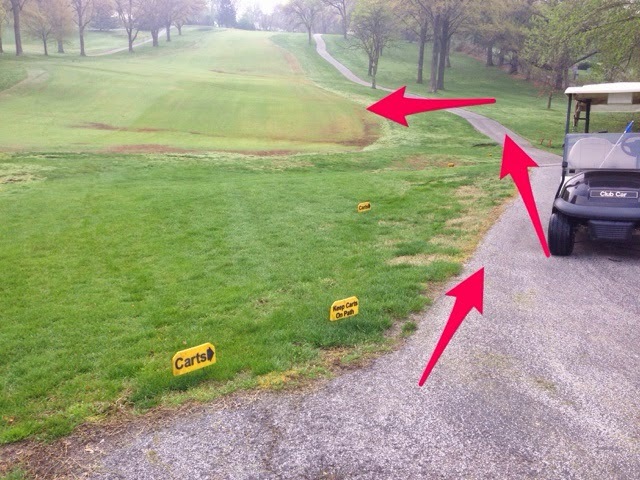 The picture below illustrates how carts should proceed on a hole from tee. #3 has Bermuda that is slow to establish from last falls spray and also is usually wet in the spring. Our efforts are to get zoysia back into all of these spread of fIrway which requires less traffic. All carts should enter fairways from the side and not straight on from the tee like a highway ramp. Excessive wear occurs plus the look of the course is effected by tire tracks from the tees. We appreciate your cooperation. The arrows demonstrate the path carts should take. It's is also helpful if carts take different paths to the fairway to reduce excess wear on the entrance paths. This is another area that should be avoided. Bottom of 10 just past the right cart path. Many land below and too the right. Easy to do, drive around it. Allow it to heal. Created by shade and cart traffic. Short range grass tee is open for the season. 6 days a week. We attempt to mow the rough on outside tournament days. If that does not happen due to rain or other circumstances, it will close early on Thursdays so the balls can be picked in preparation for mowing. Our old golf course develops a number of wet areas in the spring and they slowly begin to dry as rain dissipates during the summer. Sometimes a wet area pops up and it is not a spring but one of the many 4" clay drain lines that cross the course from area to area. We've had a wet area develop on #7 down in the valley and Skip and Russ did some investigating on Monday. They dug up the area and found out a clay line that carried water from the area of #5 on the course down across #7 was clogged. It was full of mud and water was leaking out from the joints in the pipe and was coming out at the bottom of the hill. The guys dug up the area and found an old metal water line underneath it which we don't want disturb. Skips experience over the years are that we are not sure if all these old water lines on the course are not possibly still live. We also found another clay tile accidentally when digging along the first clay line. The guys cracked the 2nd clay line which worked in the end of us. The crack in the pipe allowed water from the first line to flow into it showing us that we had a good flowing drain pipe. Years ago a black drain tile was placed in the swale to remove water from this area. We had originally planned on connecting the clay line running down from 7 cart path to the black line but the finding of the perpendicular clay line changed those plans. With the black drain line exposed we decided to place a new surface drain in this area which will help remove surface water underground quicker and more efficiently. 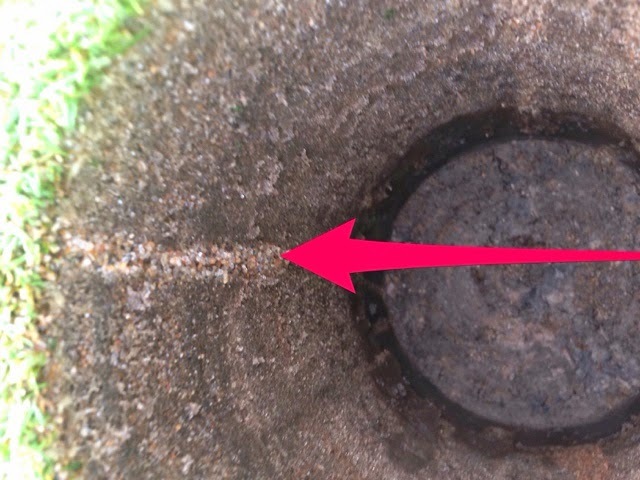 The quicker water gets into the drainage system, the less damage it can do and the drier the turf areas can become. Major leak coming from old 4" drain tile. This pipe was coming from the cart path on 7. Water draining out of pipe after clog/dirt was removed from pipe. A steady stream of water. The right side of the hole is the black drainage pipe that is laid in the swale of 7. Next to the shovel is another clay tile we found which rand along the black pipe. The hole in the pipe is allowing water to evacuate. We connected the two clay tiles. After back filling the area. In the foreground is a new surface drain that will help remove surface water during rainfall. This view is looking toward 7 green. The sod in this area will need to be replaced. This is the view looking up toward 7 cart path and the back of 5 tee. This area was wet on a regular basis because of the clay tile being full of dirt and probably water weeping from the hillside during the wet times. We've been looking at a couple of wet areas on #3 that travels down from the cart path on #12(spring). We also had a wet spot or two pop up in the fairway but we believe these are all related to the spring. This situation will be corrected using a sump up in the rough above the 2 irrigation control boxes. We will run drain lines to the sump and it will then feed down along the rough of #3 to the lowest area where there is a drain line running through which will evacuate the water. Hopefully this will reduce the amount of water coming out of the hill into the fairway. Wet area near the cart path on 12 but on the 3 side of the hole. We plan to place a sump in the aera of the first arrow and a drain line will then be trenched toward the 2nd arrow and down to the lowest point on 3 and connect to the existing drain line. Beginning of the sump dig. Look at the water filling the hole. This area is out in the left middle of 3 fairway down from the irrigation boxes. We have shutoff irrigation water to this fairway hoping the spot would dry up but it has not so we eliminated that potential problem. We believe water is going back under the surface and has found another weak point moving back to the surface in the fairway. Our sump drain when completed should help to dry this area if our hunch is correct. Fellas shot lights out the last few days and a wire to wire winner in Jordan Speith. Augusta looked spectacular as usual. 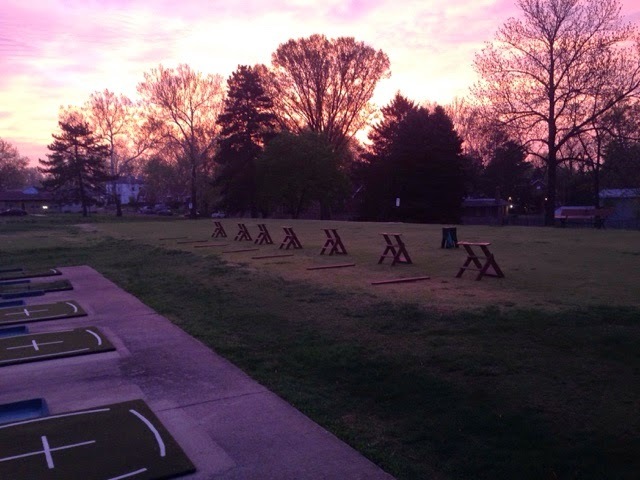 Rarely do I feel that members try to compare what we are doing here at Glen Echo to what is seen on TV during this special week at the Masters or for that matter any tournament course. Others are not so lucky in my profession with what is called the Augusta Syndrome in which members question why we can't do what they do during an event. 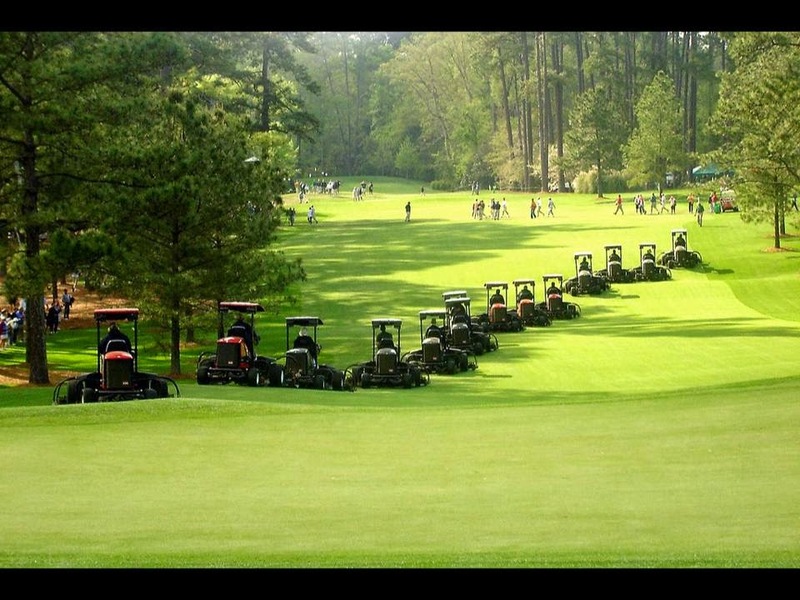 The following picture shows a line of fairway mowers at Augusta National. To place things in perspective, there are 14 fairway units/operators trans-versing this beautiful golfing property during tourney week. Including myself, assistant, mechanic and horticulturist, there are 13 of us working the property during what would be called our main season at Glen Echo. I was going through a social media site the other night and saw a great post from AccuWeather regarding Lightning Safety. The link gives you the full article but thought I would pass along our procedures we follow at Glen Echo. We use a service from DTN which supplies us with on-time lightning strikes. It does not determine if lightning can potentially occur but that lightning has actually been identified. It has a standard radar map with a 20 and 8 mile radius from Glen Echo. The pro shop and maintenance staff work together when a forecast calls for the potential of thunderstorms which can carry lightning. The maintenance staff are on the outside watching the sky for visible lightning or hearing thunder. The pro shop is monitoring the incoming storm to determine if lightning strikes are being detected inside the alert areas. I usually receive a call or text from the staff alerting me that strikes are moving into the 20 mile area. Working outside gives us a jump on quick hitting storms that are not expected. We will contact the pro shop requesting they look at the radar to see if something is happening when cloud formations appear to be severe. Usually a storm will show its true colors before it arrives to our location and its pretty obvious everyone should move to a protected site. There are situations when lightning does not occur until it forms overhead and no advance notice is given. There are also occasions when the storm approaches us and dissipates or loses its energy. We are sorry for the inconvenience this may create when you are pulled off the course and then nothing happens but lightning rarely gives 2nd chances. Our jobs are to protect the welfare of members, guests and staff. Once lightning moves into the 20 mile range, notification is given to myself and staff. I will usually move my staff closer to the maintenance building since some of their equipment is slower. The site is monitored for strikes up to the 8 mile range. Once the 8 mile border is breached, the pro shop will sound a long horn blast from an air horn to evacuate the course. The blast is not the okay to evacuate the course once your finish the hole. The blast is to proceed to safety immediately because lightning strikes have been located within the kill zone which is less than 8 miles for a majority of lightning/human strikes. The best site to evacuate would be the pro shop and or clubhouse. A secondary/last resort facility would be the Field Bar if you are on the far end of the course. Usually a second horn is sounded at a further area out onto the course so those of you at the far end can here as well. We make every attempt to pick up walking members who are out on the course. If you do not see someone coming to your aid, call the pro shop to make sure someone is on their way for you. Maintenance members in carts on the course are able to pick up members as well. I usually send a group text or we come out and find each individual employee to insure that they are coming in. You might assist our staff as well if you hear the blast and they do not appear to react. They might not of heard the horn sound. All individuals on property are treated the same when it comes to lightning safety. We want everyone safe. All members, guests and employees should proceed to the closest shelter. Shelter does not include tall trees as this could become a target for lightning! Once the lightning has cleared and the course is deemed playable, another horn blast will be given to begin play. Bright sun on the back of a storm is not the go ahead to begin play. Please do not place yourself, guests, and staff in danger by beginning play before an all clear is given. We usually wait until at least 15 or 20 minutes since the last bolt of lightning and or thunder occurs. Thunder does not occur without lightning, allow me to repeat this in bold letters. THUNDER DOES NOT OCCUR WITHOUT LIGHTNING BEING PRESENT! Just because you do not see it does not mean it is not there. A cloud to cloud lightning bolt can become a cloud to ground in the blink of an eye. Also, remember if heavy rain occurs, the course usually will not open once lightning has passed. It will reopen when the water has drained down enough so that our playing surfaces are okay for play. Heavy rain will usually close the course for a minimum of 45-60 minutes depending upon amount of rain. This would be another reason if at all possible that golfers should come back to the pro shop but sometimes that is not possible. Another excellent link for Severe Weather 101. Great questions and answers regarding lightning to help you understand the severity of this deadly force. 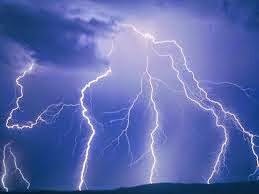 Over 50% of lightning deaths occur on golf courses and a majority of all lightning deaths are men. Do we not listen, are we too stubborn, nah that can't be it could it? There are more men participating which probably increases our chances. I tend to be more on the cautious side of lightning and incoming storms. Large trees, metal objects such as golf clubs and equipment are big targets in attracting lightning and wind which can snap limbs and endanger all of us as well. We appreciate your cooperation during these events. There is a long triangle of lawn that borders the parking lot near the champions reserved parking spots. This area has not been in good shape over the last few years. We have decided to remove it and expand the existing ornamental plantings. I have sprayed this area with non-selective and selective grass killers. 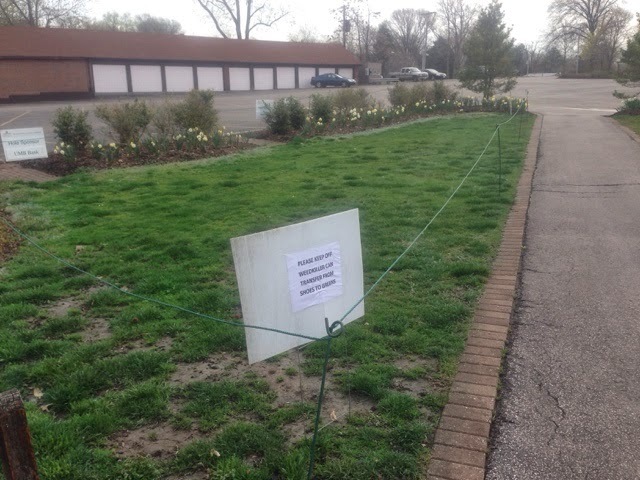 We have roped off the area and placed signs asking you to not walk through this area. The chemical can transfer from your shoes to the putting green. The Hollys that were planted in 06-07 have not thrived and will be removed. We will keep the 2 Fosterii Holly trees at the entrance to the walkway. We will remove the sod in the next 10-14 days and the build the bed. We intend to keep the walk paths allowing you to cut through the area to get from the parking lot to the practice green area.